I have been going back and forth about what to do for KITT's antenna since I started this project. I decided over Christmas that I am going to have the fender hole welded shut and I am am going to go with a concealed antenna. Although the power antenna is really cool and very 80's, KITT did not have one and the antenna would have been the only thing keeping him from being a 100% accurate exterior replica. I also rarely listen to the radio, so the antenna is not all that important to me. I let Mario know to fill it in when he does the body work on the fenders. Merry Christmas from Project: K.I.T.T. If the stupid people of the earth unite and get their way... then when the world ends today at least KITT will have most of his parts coated with POR-15. It is as close to a Molecular Bonded Shell as I am going to get. I put the third coat of POR-15 on this afternoon. 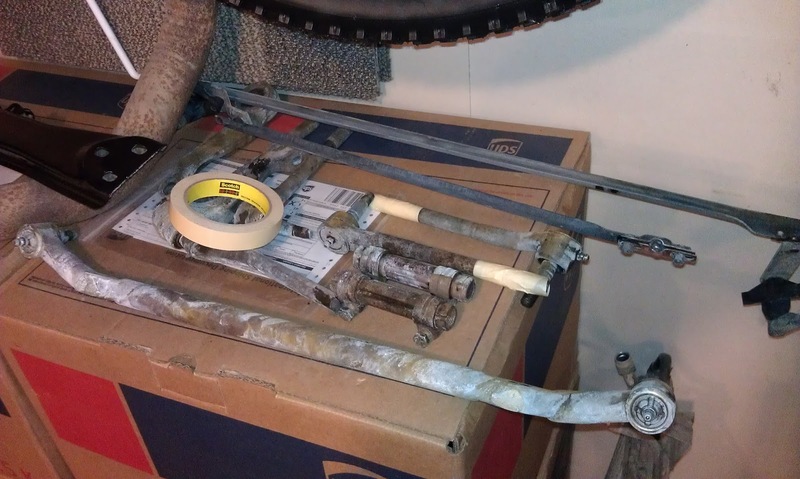 The first thing I did was touch up the wiper linkage where I had missed a couple of spots. Over the last few days I have been going back through the videos I have taken so far and cleaning, editing, and uploading them in HD. I decided to create a YouTube channel for Project: K.I.T.T. and feature all of the videos in one convenient place. You can even subscribe to the channel if you would like to stay updated on the latest videos. I got up early to turn the heaters on in the garage. It was 8 degrees at 5:00AM when I turned on the heaters. At 8:00AM it was 5 degrees! I was thinking to myself there is no way I am going to be able to paint today. Surprisingly at 12:30PM it was 53 degrees in the garage...and warm enough to paint! 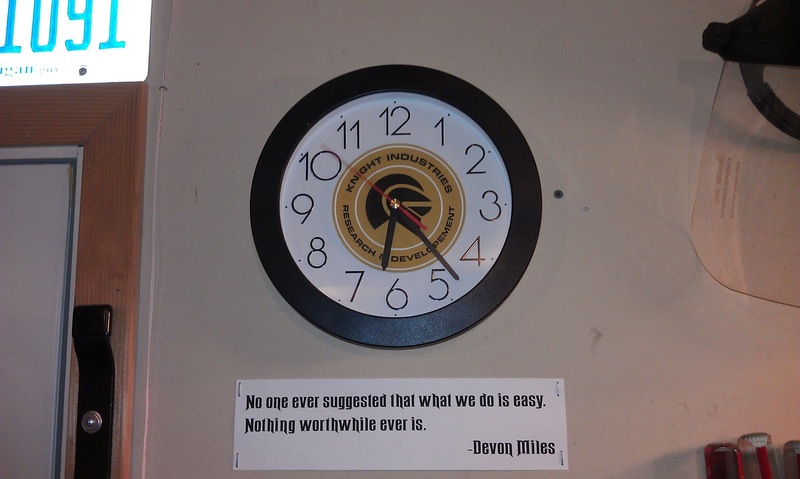 Just as I was going to get started I got a call about a job opportunity and had to make a few phone calls. I did not get back out to the garage until 1:30PM. I had to start by masking off the threads on the tie rod ends. I decided I could paint carefully around all of the other parts. What Can You Do With Four Tubs, Marine Clean, Water And Prep And Ready? 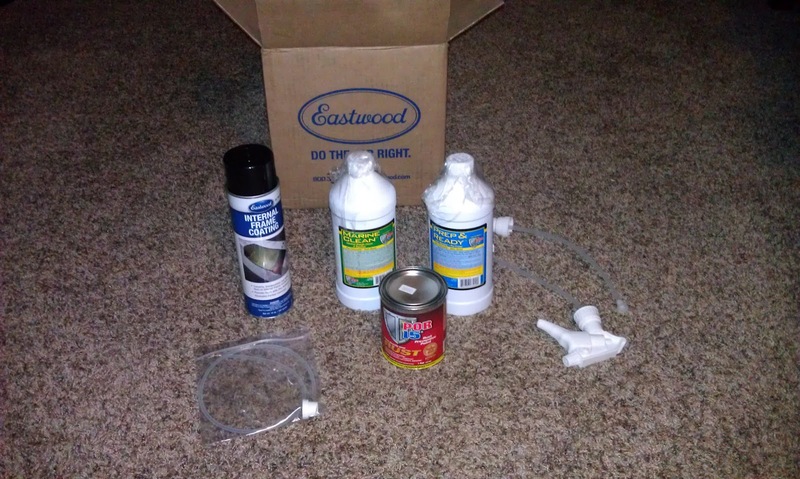 My order from Eastwood arrived today, which is good because I needed the supplies in order to continue working on the cowl and steering linkage. 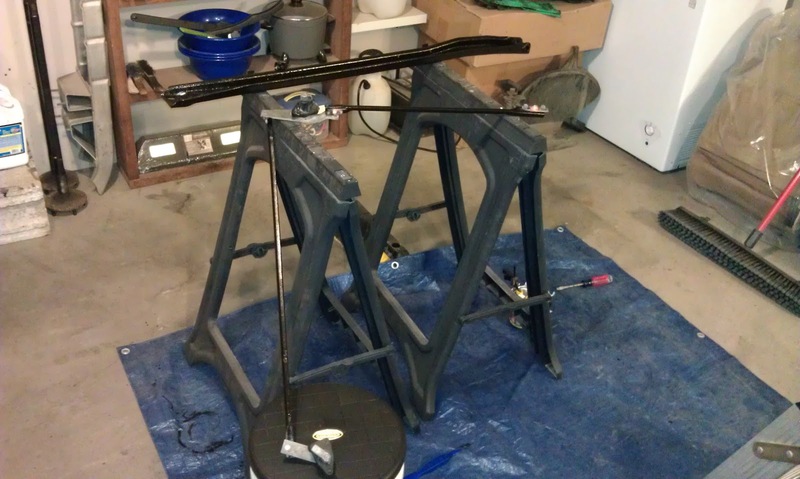 I ordered a quart of both MarineClean and Prep and Ready, a pint of black POR-15 and Eastwood's Internal Frame Coating. My focus for today was the cowl area. I wanted to get it cleaned out so it can be prepped for paint tomorrow when the extra supplies I ordered get here. Here is a picture of the external cowl area. As I had previously posted, Mario Gourde is going to be doing the body work and painting KITT for me. 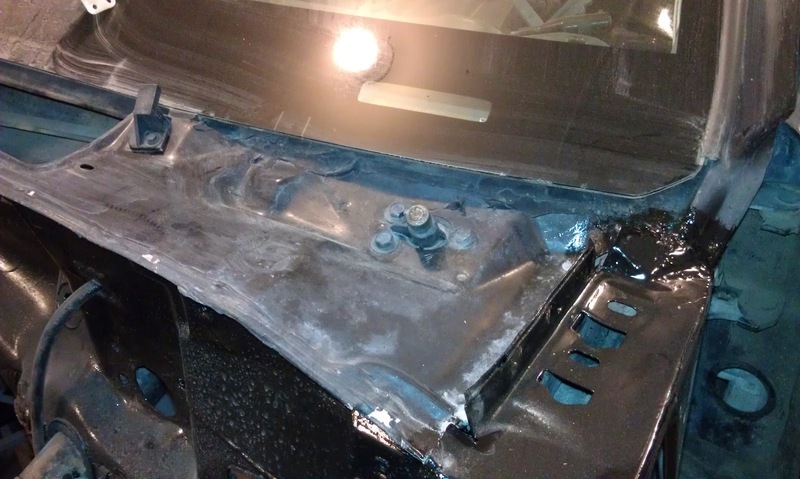 He contacted me this weekend and said that he had the hood and fenders sanded down and wondered if I had the other parts ready yet. Since I had removed the spoiler and the front nose mounting bracket this week they were ready to go. I looked in the garage to see if I had anything else he could get started on and came across the rear marker light bezels. Sara and I loaded everything up in the Freestyle and took them over to Mario's. After the garage warmed up this afternoon, I decided to remove the wiper linkage from the cowl in preparation for cleaning, prepping, and painting the inner cowl area. As far as I know I will have the only KITT replica featuring high gloss wheel wells. I have seen pictures of a lot of replicas, but I have yet to see one with glossy wheel wells. Even my plastic inserts are coated in high gloss black POR-15. Well maybe not forever, but at least as long as I am able to drive him... that's why I am going through all this work to coat everything with POR-15. 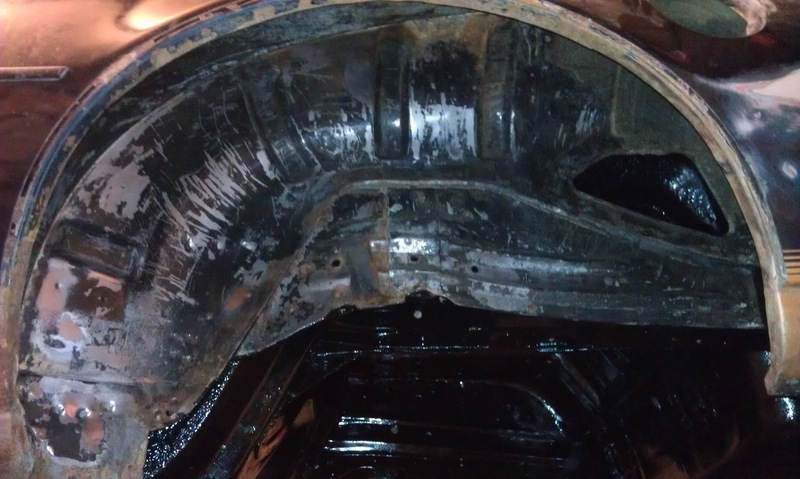 I spent the day removing the undercoating from the passenger side rear wheel well. There were many points during the day when I considered just lighting it on fire and calling it good. I ended up using Zip-Strip as I did on the driver side wheel well. The only difference was I had not experimented with three different removal methods before trying Zip-Strip on this wheel well. Needless to say the undercoating on this side was much thicker when I started. 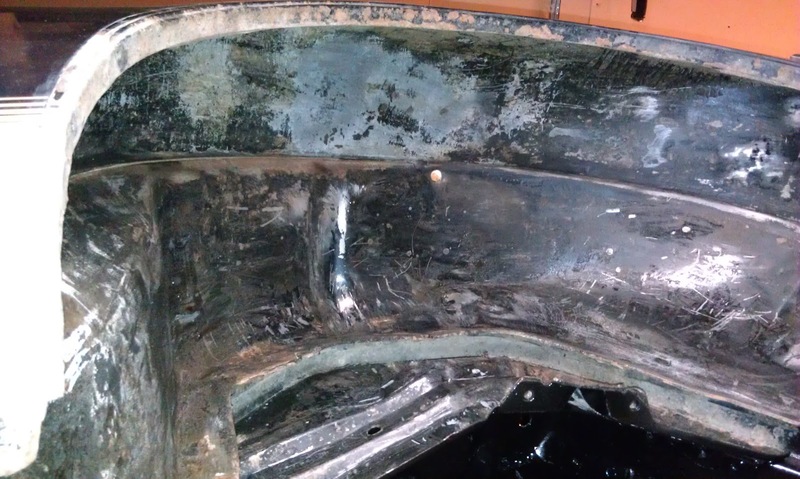 Below is the passenger side wheel well (with undercoating removed) waiting to be cleaned with MarineClean. I took this picture at 5:00PM. This afternoon I continued my work on the wheel wells. Here is the picture of the driver side wheel well that I forgot to take yesterday and promised I would post today. You can see the area where the fuel filler neck passes through the wheel well. I did not completely remove the undercoating in this area. 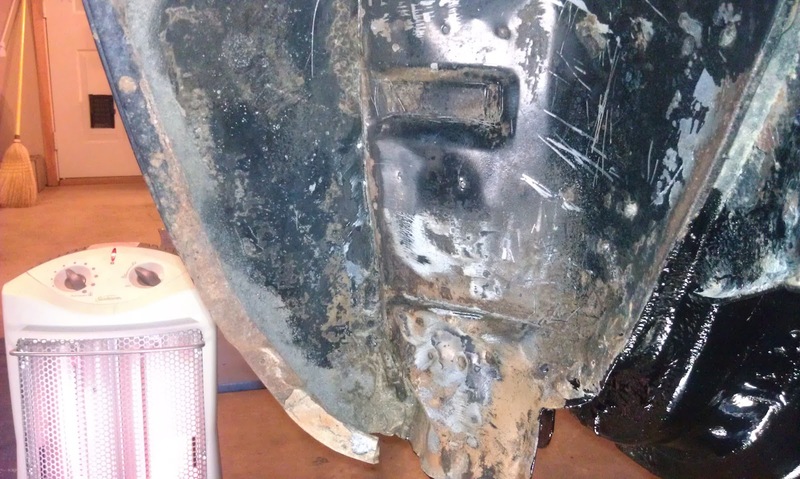 There was no rust and this area is covered by the plastic shield we repaired and painted with POR-15 a while back. 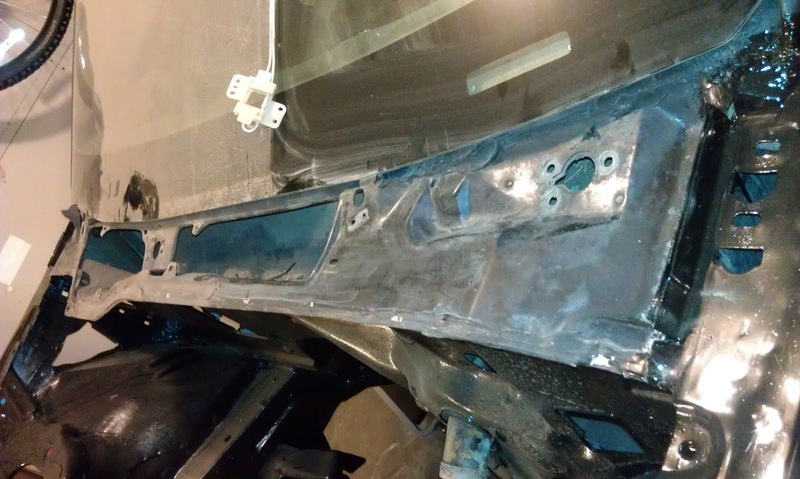 This driver side area needs just a little bit of wire brushing and then cleaned with MarineClean and prepped with Prep and Ready. 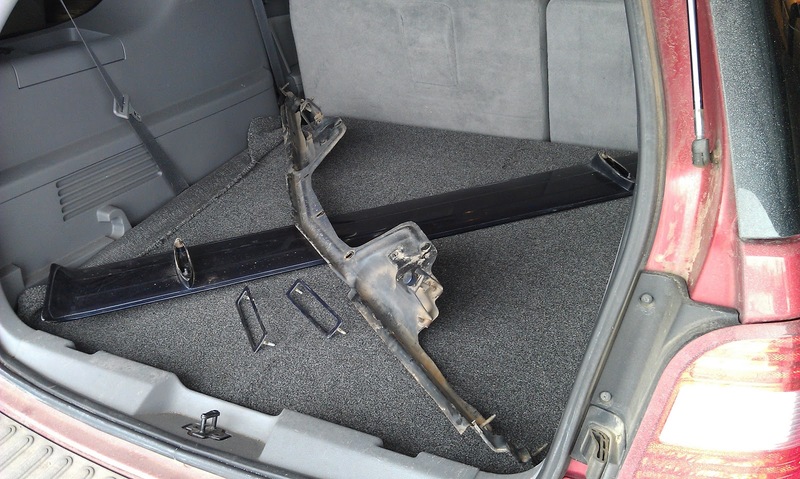 I spent the afternoon stripping the rest of the driver side rear wheel well. I forgot to take a picture of it today, but I will upload one tomorrow. While waiting for the Zip-Strip to soften the undercoating, I cleaned up the garage so Sara could park inside tonight. My goal is to have the wheel wells finished by Friday night.